Ladbrokes is a betting company in the United Kingdom with roots dating back to 1886. Today, the company has more than 14,000 employees worldwide. In 2015, Ladbrokes merged with Gala Coral - another major betting company - to become the largest bookmaker in the United Kingdom. BONUS INTRODUCTION – Register your account today to receive your first promotion, a free bet up to £50! Regulated in Gibraltar, Ladbrokes does not accept wagers from citizens of the United States. Ladbrokes took this stance based on advice from its lawyers that telephone and internet gambling is against federal and most state laws in the U.S.A. Most sites offer promotions up for a percentage of the amount from your first deposit. Ladbrokes offers a unique initial bonus of up to £50, which you can use as a free bet. The one condition that the site has it that the free bet must have a minimum odd of 1/2. To get the free bet, sign up and enter the promo code F50. The free bet stakes are not returned to you if you cash a winning ticket on your free wager. If you ever have a question and in need of an answer, then click on the "Help" section. 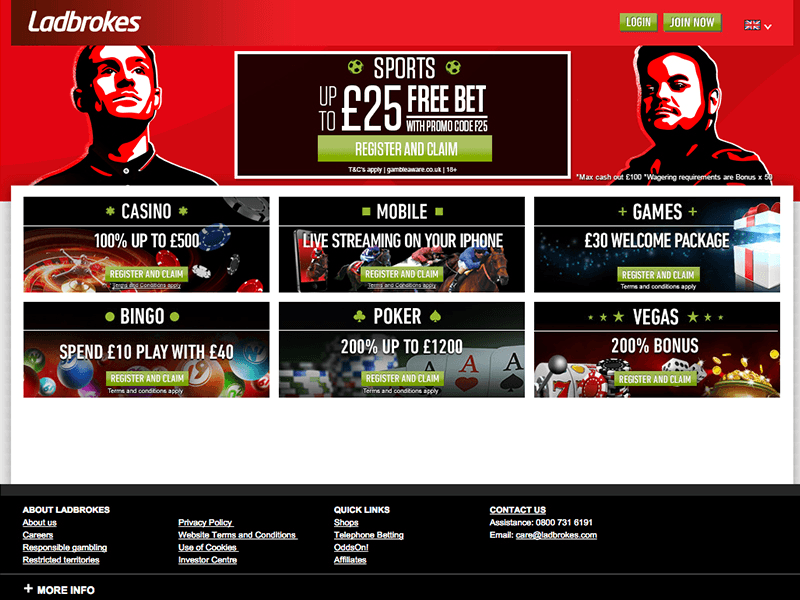 Ladbrokes neatly lays out all the different categories of inquiries in front of you for easy navigation. The site offers four different ways of contact - email, phone, live chat, and Twitter (@LadbrokesCare). The phone number is 0800-777-888 in the UK and +44 208-515-2565 outside the UK. There are a multitude of ways to receive your payouts on Ladbrokes - credit card, debit card, PayPal, bank transfers, Neteller and Skrill are all available methods of filling up your account. Customers can also request payouts in cash form if there happens to be a Ladbrokes shop nearby. Yes, Ladbrokes has its betting shops along with its online platform. Receiving a payout often takes a few days and most, if not all methods, do not come with any unwanted fees. When you sign onto Ladbrokes' website, the first thing that will catch your attention are the many fascinating advertisements that appear. Ladbrokes' site might look overwhelming at first glance, but going to any part of the site is only a matter of clicks away and all the content that you see is organized in a very methodical way. There are three different pages that users can select as the starting page - homepage, football, and horse racing. 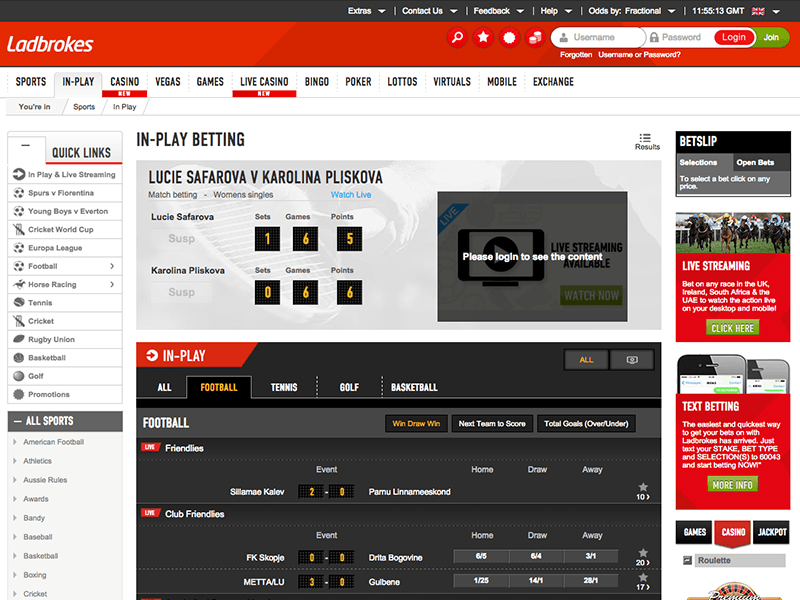 Ladbrokes also makes its site available in Swedish and German. Odds on Ladbrokes can be particularly lopsided whenever there are big money favorites, which may not be particularly suitable for less experienced bettors. Just as the results of a game change as the match is in progress, so do the odds on Ladbrokes also update from time to time. The only odds formats that Ladbrokes supports are decimal and fraction. American odds are not available on this site. Some sites offer live betting only for sports leagues that it considers to be popular. Luckily, Ladbrokes is not such a site. Live odds on Ladbrokes are available for even the minor sports leagues. However, the site is more selective when it comes to live streaming. 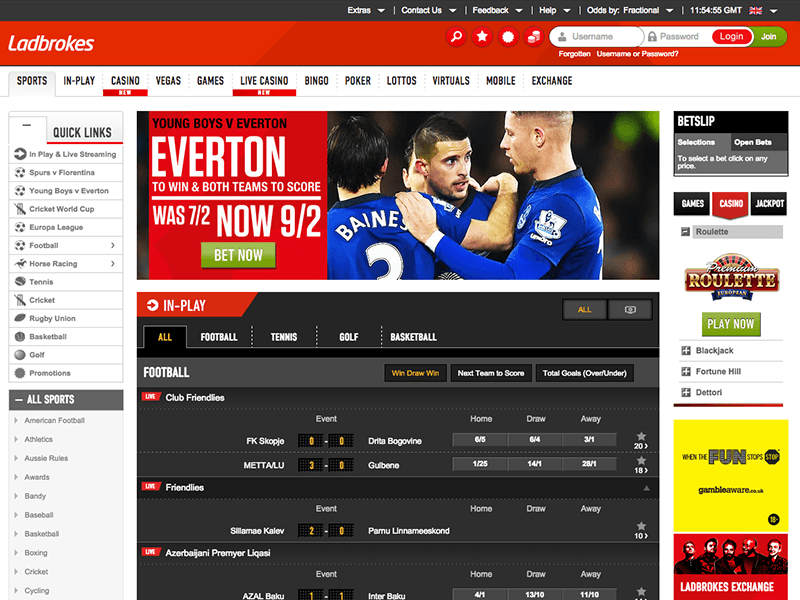 Ladbrokes offers many opportunities for live wagers, but only provides live streaming for certain games during the day. Ladbrokes is a British site, but it does provide wagering fixtures for all the different sports that people around the world may be following. There is also a fairly long list for the different types of bets that are available, from single bets to multiple yankees. Would you be down to try one you haven't yet? Every method that is usable on Ladbrokes for payouts also works for deposits when your account is running low on cash. Payouts usually require a bit of time, but deposits with most of the methods are instantaneous. You can make most of your deposits without having to pay any additional fees. Ladbrokes also has shops that work like local banks, where you can visit to make a deposit in person. The free bet worth up to £50 is just your gateway to the many amazing promotions and bonuses that you can receive as a bettor on Ladbrokes. The site offers most of its bonuses for the more popular betting options in the British market such as soccer, horse racing and greyhound. In the sportsbook, you can also receive cashouts, which are returns on your bet before the match officially ends. You can access the Ladbrokes mobile betting site by texting the word MOBILE TO 86131 and receiving the link via text. Apple users can download their app called SportsBet from the App Store. You can also visit mobile.ladbrokes.com. 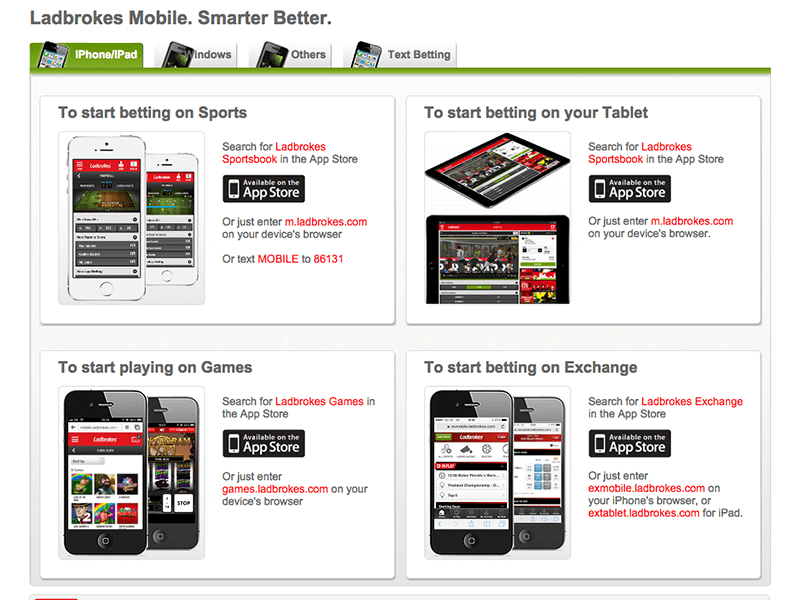 The mobile option for Ladbrokes works with both Mac iOS and Android, as well as instant play on HTML 5. Today, soccer, horse racing, and greyhound racing continue to remain the main areas of focus for Ladbrokes. Still, this by no means suggests that you're only limited to these options. Every day provides new chances for winning bets, whether it is through the multiple fixtures on the sportsbook or the different tournaments in the poker room, which have a €5,000,000 prize pool every month. Ladbrokes never fails to bring the experience of Las Vegas directly to your device. Their casino site has a menu of several hundreds of games to choose from, including all the popular games you commonly find at the casino. The live casino on Ladbrokes has Roulette, BlackJack, Casino Hold'em, and Baccarat for you to enjoy. You can experience the casino action both on your computer and mobile devices. Ladbrokes' Poker room is a place for both novice and experienced players to find a table to play and come out with a win. Every day of the week, there are classic, high-roller, and major tournaments that offer prizes ranging from €1000 to €25,000. In one month, this totals to a prize pool of €5,000,000. Download the poker room today for a chance to claim the awesome prizes. Bingo is also offered at Ladbrokes, and it comes equipped with an enticing sign up offer. Deposit and spend £10 or more on bingo tickets only and they will credit your account with an extra £30 Bonus (£25 bingo bonus and £5 mini games bonus). As a traditional British bookmaker, naturally the racebook at Ladbrokes is rich with wagering opportunities every day on both horse racing and greyhound racing, a popular sport in the UK.